Either somebody in Peru turned on the big head mode cheat, or there is something seriously off about this pile of bones. 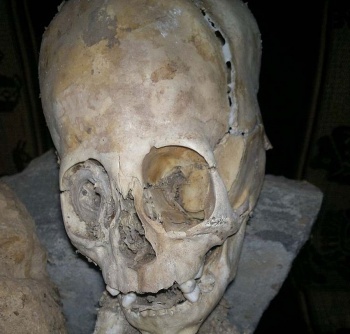 The image at right depicts a mummified body recently unearthed by Peruvian anthropologist Renato Davila Riquelme that he believes is an extraterrestrial. Or, more specifically, that he originally believed to be a deformed human child, before Russian scientists swooped in and said, "Да друга. То есть чужой." It has a non-human appearance because the head is triangular and big, almost the same size as the body. At first we believed it to be a child's body until Spanish and Russian doctors came and confirmed that, yes, it's an extraterrestrial being. Here in America however, we have a long and storied history of doubting the Russians, so I would like to posit the possibly controversial idea that maybe, just maybe, this is actually a human. I'm thinking it was a child who was either born with a horrific deformity or whose skull was shaped via primitive socioreligious ritual. Granted, if Riquelme had been approached by adorable British scientists making the claim, I would probably be writing an alarmist warning against the imminent invasion of giant-headed extraterrestrials, but the Cold War only ended two decades back, so I'm pretty sure this is a communist ploy to steal our precious bodily fluids somehow.